Ep. 085 Addiction, Habit, and Compulsion; Starting a new lace pattern; Searching for Sock Longevity; Hats and Women in Humboldt. Welcome to Episode 85: Continuing Discussion of Positive Addiction; Starting a new lace shawl; Making Socks Last Forever (almost); Women turn to Millinery in Humboldt. Margaret searches for sock longevity and discovers a trove of information in The Knitter’s Book of Socks by Clara Parkes. She finds fibers, twists, and stitches that help socks last longer. Catherine continues our exploration of the possibility of positive addiction. 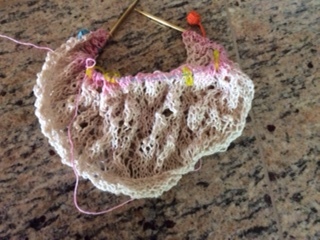 From an online sources, Changing Minds https://www.ravelry.com/yarns/library/schoppel-wolle-zauberball-cotton, she presents differences in addiction, habits and compulsions. We have a sock book give-away this week. Be the first person to ask for it on the Episode 85 thread to win. In this episode of Teaching Your Brain to Knit, We continue our exploration of positive addictions, do they exist and are they different from habits and compulsions; Catherine starts a new lace shawl l— Heaven Scent; Margaret searches for sock longevity; and we trace the history of women and hats in Humboldt County. We also have a new book give away. While editing this podcast, I searched for a link to Humboldt Millinery and I discovered a “permanently closed” notice online. 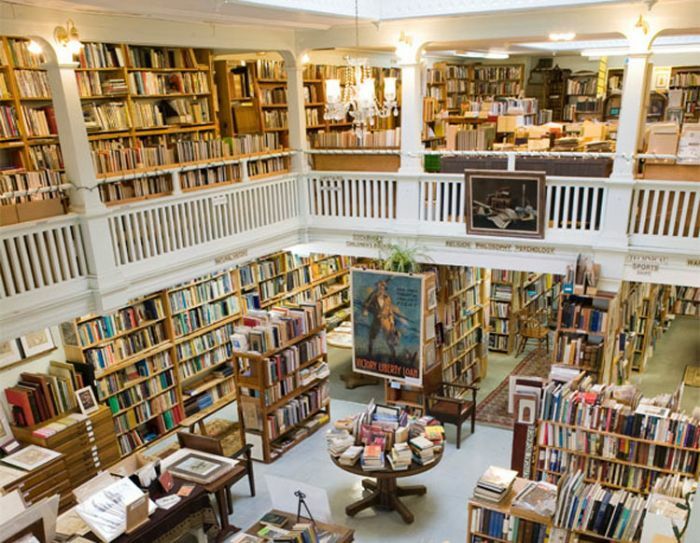 There are, however, stores in Ferndale that carry vintage clothes and hats and even a dedicated vintage dress shop in arcata called Vintage Avenger on H Street. Welcome to Episode 62: William G. Perry’s levels of Intellectual Development; Laura Nelkin’s The Forzo Cuff; Bunnymuff’s Absolutely Essential Scarf; and Rock slides in the area. 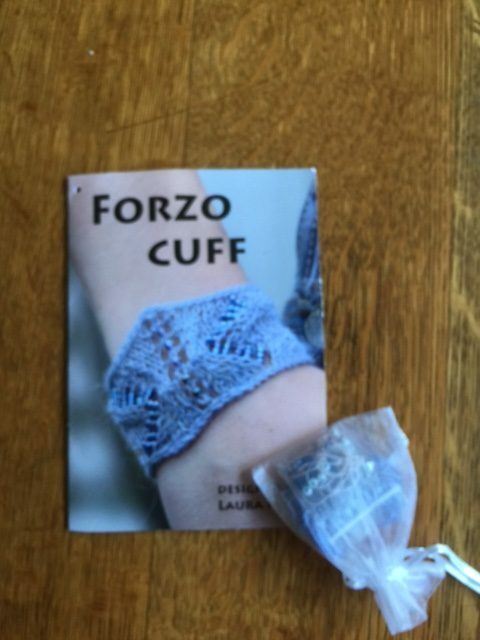 Margaret isn’t ready for the challenges of The Forzo Cuff by Laura Nelkin http://www.ravelry.com/patterns/library/forzo-cuff. She will give away her slightly used kit to someone who is. Just post on the Ravelry thread — first come, first served. 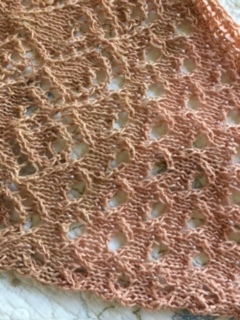 It is knitted lace. Find the difference between that and lace knitting: http://theknittingbuzz.typepad.com/the-knitting-buzz/2011/03/knitted-lace-vs-lace-knitting.html. Catherine continues her long trek with Absolutely Essential Scarf by Bunny Muff http://www.ravelry.com/patterns/library/absolutely-essential; now becoming bored with a stitch that was frustrating her awhile ago. She is also starting socks for a local charity campaign organized by The North Coast Knittery using Kramer Yarn https://northcoastknittery.com/. His ideas don’t judge what you believe but how those beliefs are formed and held. Cokleymonster on our Ravelry Thread reminds us to keep notes on our knitting as we go along. How Intellectually developed are your ideas? In this episode of Teaching your Brain to Knit we outline William Perry’s theories. We also share how Margaret faces a wall of learning challenges with the Forzo Cuff; how Catherine finds Persistence on the Absolutely Essential Scarf; how to deal with rockslides in the Redwood area and a tip about remembering details of your Knitting. Margaret just finished the super quick Crochet Cobweb Pattern by Jennifer Hansen or the Stitch Diva. It’s free and a great Halloween or otherwise fun decoration. She used a generic version of Kid Silk Haze (lost ball band) and got more practice use sticky mohair. 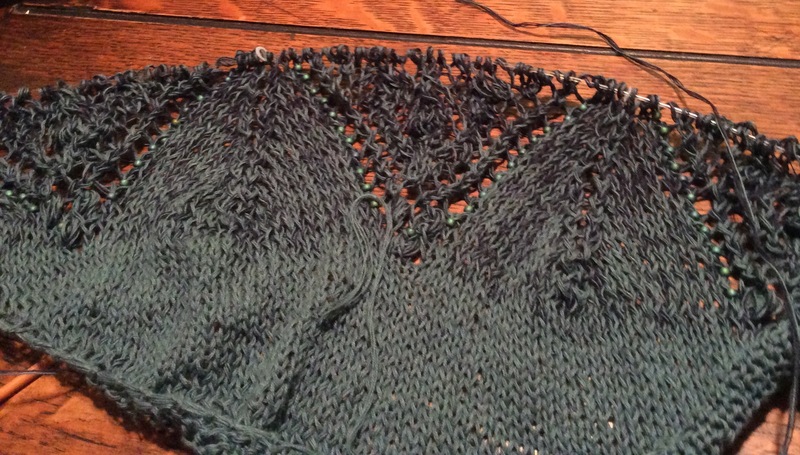 Catherine is now grooving with Vanessa Ives Mystery KAL by Bunny Muff with Woole’s Yarn Creations color changing cotton.. She is using toho beads. 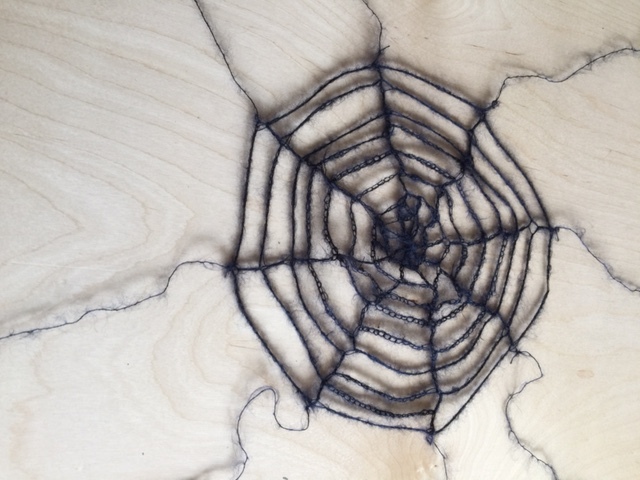 Margaret discusses the Myers Briggs Personality Inventory and how is might help to explain Knitter’s and Crocheter’s issues with process and product in their project. Check here for an introduction on the Judging and Perceiving pair in Myers Briggs. Catherine took the Haunted House Tour of Eureka (CA) and learned why mezzanines were so popular in the Victorian bars in the 1800’s. 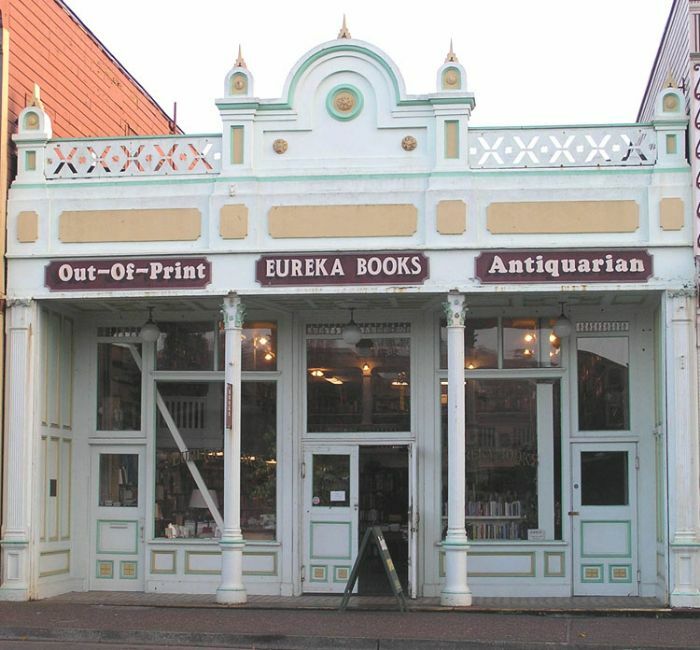 Here are some photos of Eureka Books. The interior shows the intact mezzanine from the old days. 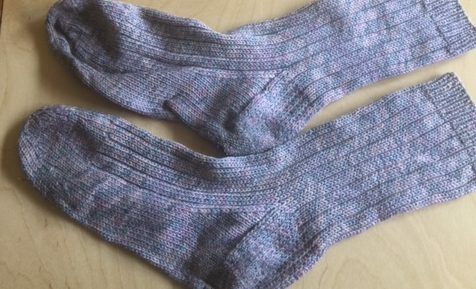 Margaret offers Cat Bordhi’s tip of using mohair or a mohair/silk blend as a reinforcing thread on the toes, heels and even the soles of socks.